Have a nice view you want everyone to see? Position the window panels to face that view so guests can see it. Have a view you don't want everyone to see? Position the wall panels to hide that view from guests. Want to have a zipped entrance wherever you like around the marquee? No problem, just fit a zipped wall panel where ever the entrance is required. Connecting marquees side by side and want people to see out of the end? No problem, just fit windows at the ends of each marquee. 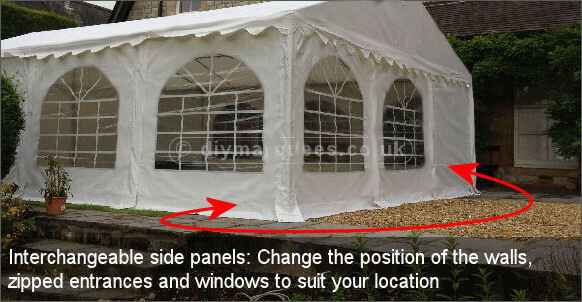 Want to use a different layout of windows and walls each time you erect the marquee? No problem. All of these are possible with an interchangeable side wall system as used in our commercial, professional and deluxe ranges. All of the side panels are 2m wide and while erecting the marquee can be positioned anywhere around the marquee. It's a very quick job to change them even when the marquee is fully erected too!